Originally named the Border Cities Arena, it hosted the Detroit Cougars (later re-named the Detroit Red Wings) for the 1926-1927 NHL season, while the Olympia Stadium was under construction. The Border Cities Arena, built a year before for the local junior hockey team, was expanded from 6,000 to 9,000 for the Cougars. 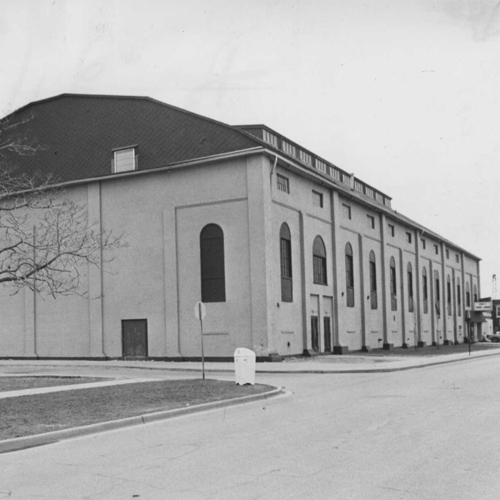 The arena was later renamed the Windsor Arena. Having been constructed in 1924, the arena is among the oldest of its type in North America. Inside the arena's halls are pictures of teams gone by, of old matches and players, and of the construction of "The Barn", along with historic newspaper clippings related to the hockey teams that played under its roof over the years. Adding to this �throwback� experience is the odour of the arena concourse during Spitfires games, especially near the teams' respective dressing rooms. The obvious odour of heated OHL competition coats the cramped quarters between bench and locker room.